NEW YORK — If it was home runs that set up the Red Sox, it was only fitting they would be their undoing as well. With Jonathan Papelbon on the mound, a closer who had turned shaky into stellar by not allowing an earned run since April 24, New England’s favorite villain stepped to the plate with one on and the Yankees down, 9-7, in the ninth inning. Alex Rodriguez smashed Papelbon’s first pitch, a 94-mile-per-hour fastball, into the Red Sox bullpen in left-center and Marcus Thames hit a two-run blast three batters later as the Yankees dealt the Sox a crushing, 11-9 loss last night. It spoiled some redemptive stories for the Sox, who hit five home runs. David Ortiz hit his sixth homer in May, two homers lifted Victor Martinez out of an 0-for-19 hole, and Tim Wakefield threw 2 1/3 scoreless innings in relief. It was, instead, the arm of Papelbon that bore the brunt of a loss that was not entirely his fault. Two days after he threw a scoreless 2 1/3 innings against the Tigers, Papelbon was called on again. And, as opposed to the mix of fastballs, splitters, and sliders that had generated some of the best results of his recent past, Papelbon turned to power, throwing 19 straight fastballs. It betrayed him. They would not go quietly, these Yankees. So, after nearly four hours, it was Thames chugging around third, heading toward a gaggle of teammates at the plate. He tossed his helmet in the air as if he had graduated in a Yankee Stadium filled with 48,271 delirious fans. The loss was on the shoulders of Papelbon, who saw “flat fastballs that were out in the middle of the plate,’’ turned into four runs in the ninth inning. 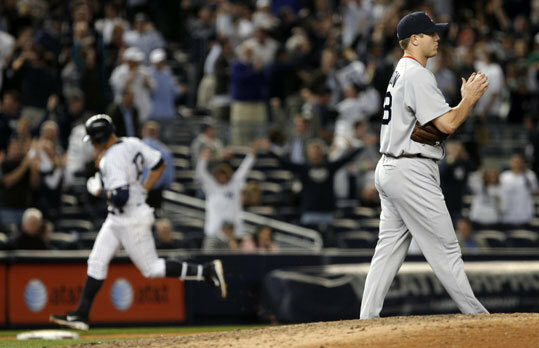 It was one of his worst defeats, one of his most dispiriting and humiliating, as he took slight solace in the fact all closers get beat, taking as example Mariano Rivera’s blown save Sunday. It was Papelbon’s first blown save since July 28 last season, a stretch of 22 consecutive converted chances. It was also only the second time in his career he allowed multiple home runs in a game, which occurred in his major league debut July 31, 2005, as a starter. Not that the loss was only on him. The Sox were in a 5-0 hole by the second inning. Daisuke Matsuzaka allowed five runs in the first, another in the second, another in the fifth. He put his team in another hole — it was 6-1 after the second — from which they battled back but could not close out. The Sox took a 9-7 lead in the eighth, as Kevin Youkilis (two-run shot) and Martinez hit back-to-back home runs to overcome a 7-6 deficit. The Sox lost for the fourth time in five games, and a bit of intrigue emerged from the clubhouse last night. The catcher was asked about Matsuzaka throwing fewer fastballs than he had in his previous start against Toronto. Martinez seemed frustrated with the amount of times he was shaken off, saying it wasn’t the first time, and it might have been more than usual. Whatever happened between catcher and pitcher, it was clear the Yankees weren’t having any trouble. It took until Matsuzaka’s 26th pitch, a double by Francisco Cervelli to center, for the Sox to record the first out of the first inning. The relay from Darnell McDonald to Dustin Pedroia to Martinez nailed Robinson Cano at the plate. But the damage was already complete with five Yankee runs in the first. The Sox were not helped by four balls hit to the outfield that could have been caught, two each by McDonald and left fielder Jeremy Hermida. One of those was a dive by McDonald on a Brett Gardner double to lead off the ninth that turned the Rodriguez blast into a game-tying homer. The Sox came back early, scoring one in the second, one in the fourth, three in the fifth, and one in the sixth. The big blow was J.D. Drew’s fifth-inning three-run homer, bolstered by a 10-pitch at-bat by Dustin Pedroia, who eventually stroked a double to left. Then the Sox scored three in the eighth to take the lead. But they couldn’t hold it, leading to a defeat that could have been the worst of the season.